We live in an era where total solar eclipses are possible because at times the apparent size of the Moon can just cover the disk of the Sun. But the Moon is slowly moving away from planet Earth. Its distance is measured to increase about 1.5 inches (3.8 centimeters) per year due to tidal friction. So there will come a time, about 600 million years from now, when the Moon is far enough away that the lunar disk will be too small to ever completely cover the Sun. Then, at best only annular eclipses, a ring of fire surrounding the silhouetted disk of the too small Moon, will be seen from the surface of our fair planet. Of course the Moon was slightly closer and loomed a little larger 100 million years ago. So during the age of the dinosaurs there were more frequent total eclipses of the Sun. 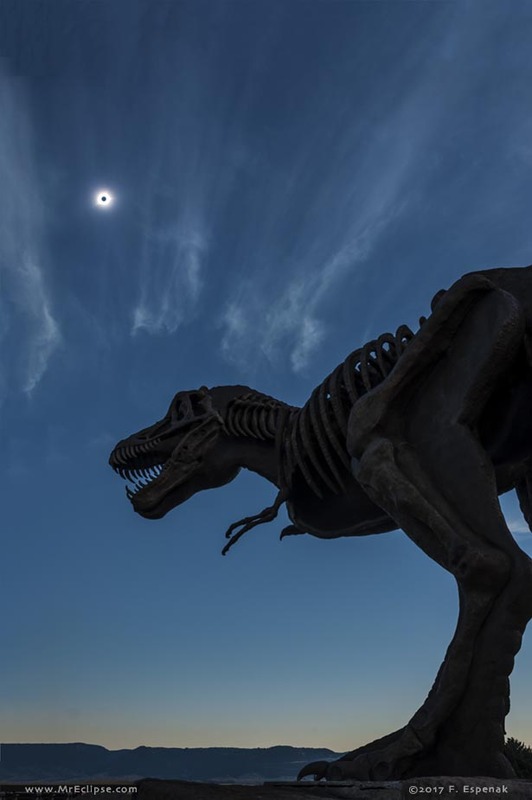 In front of the Tate Geological Museum at Casper College in Wyoming, this dinosaur statue posed with a modern total eclipse, though. An automated camera was placed under him to shoot his portrait during the Great American Eclipse of August 21. Image Credit & Copyright: Fred Espenak (MrEclipse.com).